Born in Manchester, England on the 13th June 1854. Christened John Thomas Ibbotson Tiller. John Tiller shows a keen interest in music from an early age and at ten years old became a choirboy. He took music lessons with a tutor named Dr Hiles, who later went on to be Professor of Harmony and Composition at the Royal Northern College of Music.He was always a perfectionist to the point where very few people could live up to his standards. He became choirmaster by the age of 14. At 19 his girlfriend, Mary Carr told him she was pregnant and he married young, having 10 children in 11 years. By this time John Tiller was a full partner in the cotton business and he was living in a large house like his uncle. He also pursued his theatrical ambitions and became stage manager of an amateur theatrical group made up of local business people who would perform a Minstrels act in Manchester theatres. One of John’s uncles, John George Tiller, owned a very successful Cotton agency, (one of the largest in Manchester) and was very wealthy, with a huge house and servants, John made up his mind that he wanted the same life style. He got on very well with his uncle who took him into the family business and treated him like a son. During the day John worked in the cotton trade and after work he devoted himself to music and acting. He had a very forceful character and soon progressed to management in the cotton industry, and was well known in the local area due to his immense appetite for life. In 1885 John became director of the Comedy Theatre Manchester and during the same year he began teaching children to dance. His early pupils practised for hours every Saturday afternoon amongst the bales of cotton in one of the firm’s warehouses. He also taught at his home to the disapproval of his wife. His first dance performances were at small local church dances, and due to his position as director of the Comedy Theatre Manchester he was able to arrange his small dancers a place in the theatre’s Christmas pantomime (his first real performance although not credited at the time). At this time everything went wrong for him in his uncle's business. His uncle’s son who was now old enough to work was brought into the family business. His uncle also took to drink and became an alcoholic. John had a huge argument with his uncle that ended in a violent quarrel; John stormed out and set up his own business, never speaking with his uncle again. John Tiller carried on presenting dancers in an amateur capacity. With this taking up more and more of his time, it made it hard for him to concentrate on making a living in the cotton industry. By this time his real interest was with the theatre and dance and he was getting bored with his chosen career. In 1890 John was asked to present a quartet of children for the pantomime Robinson Crusoe at the Prince of Wales Theatre, Liverpool. He chose four of his best Manchester pupils, all aged about 10 years: Dolly Grey, Tessie Lomax, and twins Cissy and Lilly Smith. They were chosen as they were all the same height and had the same very slender shape with dark hair. He worked with them relentlessly repeating every movement time and time again until they were perfect. He worked them so hard that at times they were so exhausted they had to be carried home by their parents- their feet too blistered to walk. By the late 1800's John's troupes were dancing in ballet and pantomime performances all over the world. At this time John was very excited by his conception of The Mystic Hussars routine where the girls dressed as cavaliers when performing their dance routine, this was considered quite revolutionary at the time as the girls were connected to an electrical supply and their swords lit up in the dark. John went on to conceive a simple notion, as the girls were kicking; he had them link their arms around each others waists. The proximity helped the girls work well together and at last he was able to achieve absolute precision in dance. His dream come true. There is speculation in the family as to whether he adopted the kicking and headdress after watching the Lipizzaner Stallions on one of his many trips abroad. It was this idea that was to really make his name in dance for posterity. He went on to perfect a high kicking dance for “Les Folies-Bergère”, Paris, using eight girls, called the Pony Trot that would be the start of all modern kick routines and the routine that every Tiller Girl had to learn as their first dance. John first sent a troupe of girls to America in 1900. George Lederer booked them to perform their original Pony Trot. Later at the height of their popularity in New York there were three Tiller lines working on Broadway; The Lollipops and The Sunshine Girls at the Globe Theatre, and 24 Tiller Girls in the Ziegfeld Follies. John’s wife Mary died of cancer in 1905 and he remarried to Jennie Walker in 1906. Jennie went on to be very involved in the running of the Tiller Schools until her death in February 1936. The Tiller Girls' performed for King George V and Queen Mary in 1912 at their first Royal Command Performance, going on to appear in a further 24 shows. By 1923 John Tiller's reputation built on the high standards of precision dance was at its height and his dancers were in demand all around the world. Charles Dillingham and George White had visited The Palace Theatre in London and booked the girls to appear in “Good Morning Dearie” at George White’s Scandals of 1923 and “The Nifties” of 1923. Floorenz Ziegfeld took 48 of the girls under contract for three years for the world famous Ziegfeld Follies. John Tiller opened a dance school at 226 West 72nd Street with offices and a training studio run by Mary Read; a Head Tiller Girl from England who had been one of the 1916 Sunshine Girls in America, She trained American pupils as well as the girls from the United Kingdom. She was a hard taskmaster, but a good business woman who had John Tiller’s full support in everything she did. The girls always called her Miss Read. In the 1920s, John Tiller was regularly crossing the world to finalise contracts. He always made sure his trip ended up in New York so he could meet Mary. The John Tiller Girls were the inspiration for the world famous American kicking line, The Rockettes. At the time John had a troupe of girls performing in New York called the Tiller Rockets. Russell Markert, founder of the Rockettes quoted; "I had seen the John Tiller girls in the Ziegfeld Follies of 1922," he reminisced, "If I ever got a chance to get a group of American girls who would be taller and have longer legs and could do really complicated tap routines and eye-high kicks, they'd knock your socks off!" The Rockettes first kicked to life in 1925 as the "Missouri Rockets" and made their show business debut in St. Louis, the realization of a long-time dream of their creator, Russell Markert. The Rockettes Christmas Special to this day is an unmissable Christmas tradition in New York. John Tiller died on the 22nd October 1925 in New York. Obituary in the New York Press read "Died. 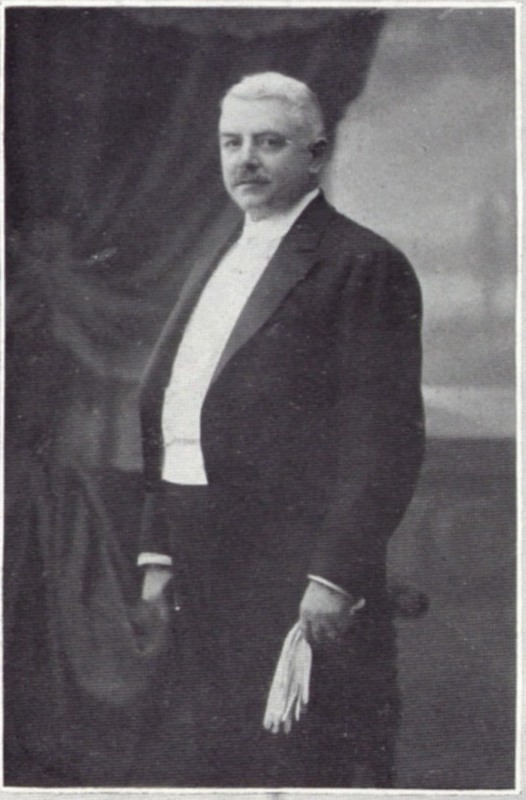 John Tiller, 71, in New York of asthma, famed English coach of numberless dancing units of "Tiller girls," who cavort upon the revue stages of the U. S. and Europe; Mr. Tiller revolutionized chorus dancing; established numerous dancing schools, from which 25,000 girls have graduated; was the author of an English law protecting dancing children from exploitation; supplied "Tiller Girls" to the Follies Bergère, the Ziegfeld Follies." Obituary in The Performer October 28th 1925; The world of entertainment has lost a man who really mattered in the death of John Tiller, and his passing in the Lennox Hill Hospital, New York on Thursday, October 22, at once robs Mrs John Tiller of a dear husband and fellow worker and the stage one of it's foremost dancing masters. Since John Tiller began on his career, in England, as a trainer of dancing more than forty years ago, the name of Tiller has become world-wide in its significance, and wherever troupe dancing came under discussion at once would rise to mind that name. He was a Manchester man , first seeing the light of day some seventy-two years ago. (note our records show he was 71) Originally employed at the Manchester Cotton Exchange, Mr Tiller became interested in theatricals through his connection with an amateur concert party and his first step in his professional career was taken when he trained his "Four Little Sunbeams," adopting a method of training that produced results of an outstanding merit. Team work was the basis of the training and for team work Tiller Girls have been renowned. After John Tiller died in 1925 Mary Read continued with the Tiller Girls in America, signing a very profitable contract with RKO studios with many of the girls working in American made films and dancing all over the USA. Many of the girls married and settled in America, most of them dancing and choreographing in American shows.